Thunderbolt Master Magazine Pouch: This new and unique magazine pouch by Black Scorpion Gear, was designed with the collaboration of Grand Masters Shooters Emanuel (Manny) Bragg and tested by him, by Shooter Shannon Smith and Spain Champion Gorka Ibanez. 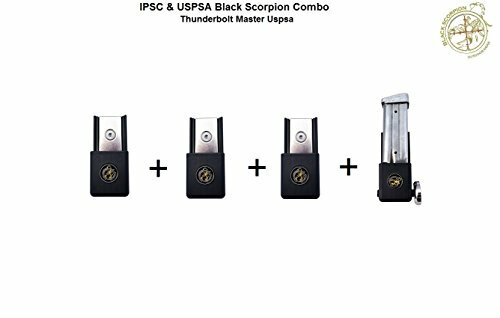 The Thunderbolt Master s the Pouch that the shooter may use without any changes or adjustments, other than the position and desired angle on his belt he or she may use any magazine double stack 2011 of any gun manufacturer. Is legal in USPSA , in Limited and Open Division Only. Remember no legal in Production Division. This Magazine Pouch with its magnetic hold provides the shooter with the ability of setting it at any angle with strong hold and at the same time helps enhance the speed and overall performance at reload. Light weight, ABS Polymer strong and durable material. Designed for the Competitive Edge Expected by the Best. Fits only 2011 Double Stack. Fits all 2011 Magazine Market. Ambidextrous design for Left/Right Handed user. Rotates 360 degrees for increased comfort and speed. Complete with Master Belt Loop For Competition Belts width 1.5"